So, when I posted that last post I was at the airport getting ready to leave. I am now in Korea, and actually have been for a couple hours. But let’s back up a little, shall we? My mom drove me to the airport, which was a decently long drive, going from Knoxville to Atlanta, and we also left pretty early so that I’d have plenty of time to get through the airport. Much better to sit around bored for a couple of hours than to miss the plane. So we finally arrived and I really got pretty nervous. I get incredibly nervous when I go to airports (usually I’ fine once I make it to the gate, but I’m always worried I won’t make it) and this time was the worst. I actually was a afraid I’d throw up. I checked my bag, my luggage wasn’t overweight fortunately, and then said my goodbyes to my mom and her boyfriend Mike. At that moment, I didn’t feel much of the excitement I had felt before. I got through security, rode a tram all the way to E concourse, and then found I still had a decent two hours. I was hungry, so I got some chinese food and I made my last blog post. My nervousness melted away, and then I wasn’t nearly as hungry. While waiting for the flight, I met two other teachers, both of which were hired by public schools instead of a hagwon like me. One was going to Jeju and the other to Seoul. All of us had different age groups as well. We boarded the plan and took off on time. The Korean Air stewardesses had fantastic uniforms and were all so pretty. The flight was long, 15 hours. And it was challenging to sleep on the plane. The inflight food was pretty good, and I had an aisle seat, although I would have preferred a window seat. I watched several inflight movies, In Time (not bad), Drive (fantastic), Real Steel (pretty good), and Cowboys and Aliens (put me to sleep). It wasn’t a bad flight at all. Landing in Incheon was exciting, and they announced that was 0°C outside, so I put on a jacket. Then took it off almost immediately. The immigration line was very long and there were so many people that it had gotten incredibly warm in that room. I was sweating. I finally made it through the line and I went to baggage. I was really nervous, but excited to meet someone from the school. My agent had given me a phone number for the person who was going to pick me up from the plane, but it referred to him as a “driver”. That was exactly what he was. When I exited baggage, I met a small, older Korean man with a sign with my name on it. I nodded to him and pointed to myself. I discovered he didn’t speak any English. He helped me load my bags into a taxi, so I discovered he was sent by, but not affiliated with the school. I got kind of nervous at this point. I was in a cab with a guy who wasn’t my employer and I knew I was supposed to go to my apartment, but I was afraid that I’d end up at a complex alone, with no entry to the apartment, or some kind of similar situation. I had no phone and minimal contact information and virtually no knowledge of Korean. I enjoyed the ride, but in the back of my mind, I was worried about the end of it. That was entirely unfounded. We arrived and the cab driver stopped, got out of the car and disappeared around a large complex building. He then returned and called a phone number and then reparked the car a couple times. Then three girls showed up. A Korean girl (Sunny), a British girl (Sarah), and a Canadian girl (Shannon). it turned out the two ex-pat girls were my roommates and Sarah was the girl I was replacing. They took me up to my apartment and showed me a cot in the living room, which is where I’ll be staying until Sarah leaves. My apartment, in the living room. 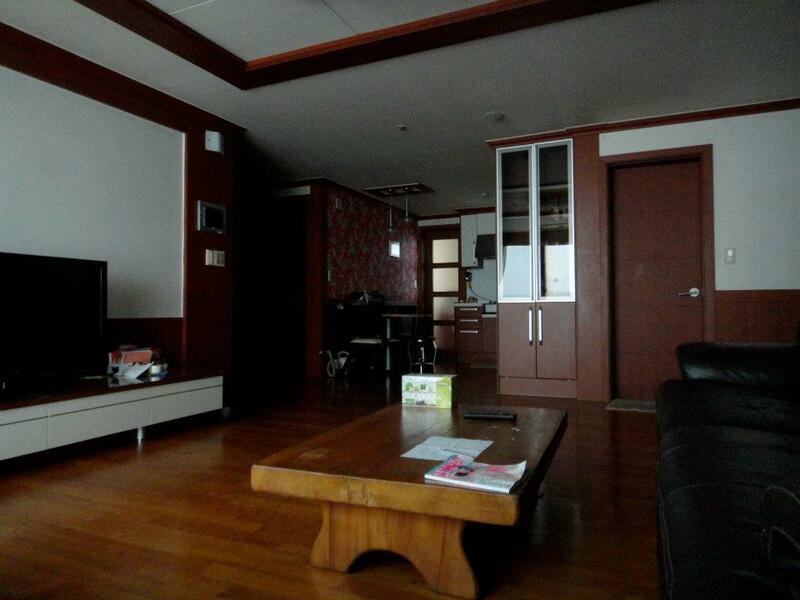 It's actually much nicer than any apartment I lived in in the States. I was impressed with how nice the apartment was. I took a quick shower, and then we went to eat. Sunny took a taxi home, but me, Sarah and Shannon went to a place to eat Korean bbq. We rode the bus to the station and we walked around a little. Bupyeong is a pretty happening place. The meal was very good, and they kept bringing us side dishes and stuff. 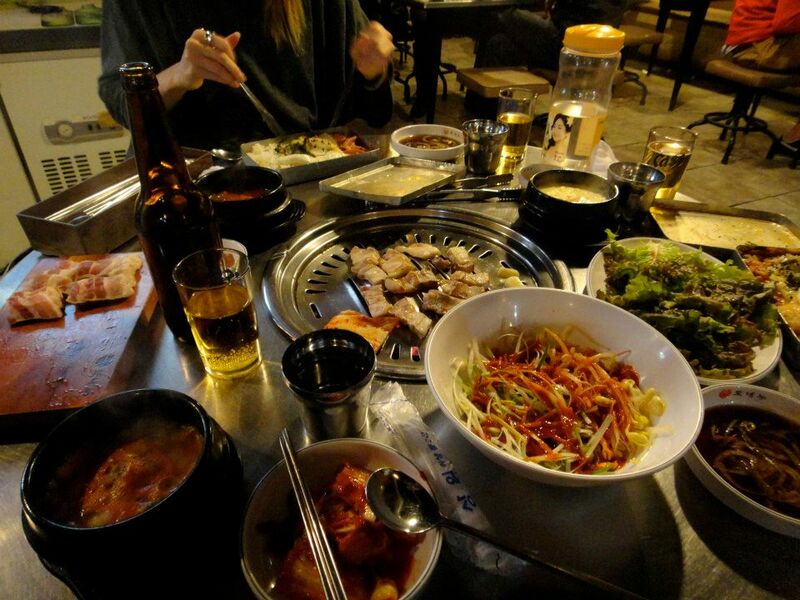 This was my first dinner in Korea. It was fantastic. During the meal, we drank a bit (I think me a little more than the girls) and then we went to a western bar above the restaurant called “Cheap Shots” (honestly, a double entendre that I’m just now catching) although both girls commented they disliked the name of the place and usually called it “Tommy’s” after the owner. I got to meet the owner as well as a few other English teachers. It was all a bit too much information to take in all in one night, but I’ve got plenty of time. When I got back to the apartment, I met the other roommate, an American named Mary-Beth. This morning I woke up a bit on the early side (I’m adjusting a bit) and I’ve just been updating people on my arrival. I’ll be shadowing Sarah in her classes today, but that won’t be for several more hours. I’d like to go out for a walk to look around, but I don’t know how to get back into the apartment, so I’ll probably hold off until later. I’m liking Korea already. ~ by James on February 19, 2012.